We bring another update today with some fixes and two new masks for the secret hunters out there. For anyone whoattempts to solve the secret puzzle after this update,will be rewarded with two awesome masks to hide your identity while you commit crimes around Washington. Would you like an update for Locke? Have you seen the ending video yet? If you haven’t, be warned! There is a small spoiler in the text below and the linked forum thread. We are asking the community if you want to update the in-game model (and background video) of Vernon Locke to the likeness of Ian Russell the actor from the "Somewhere in Mexico" film. You can find the poll and read more about the vote. 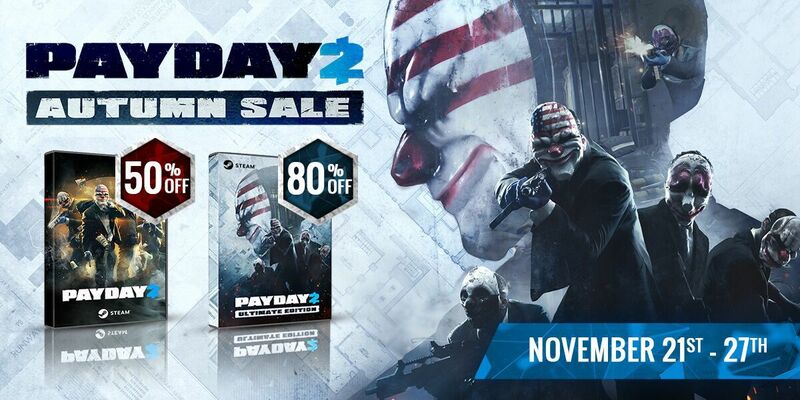 The Steam Autum Sale is in full swing and PAYDAY 2: Ultimate Edition, is on a 85% discount, and PAYDAY 2 Base Game has a 50% discount! Time to cast your votes, forsure! The White House: Tweaked the glow intensity of the lights in the RFID box. Recently released weapons now have the Immortal Python skins. Fixed some normal issues of the standard m4 magazine. Tweaked the position of the compact laser sight on the Desertfox Sniper Rifle. The Claire 12G Shotgun is no longer community locked. Fixed an issue where players were able to intimidate enemies through walls. Players should now be able to highlight enemies through invisible walls. Fixed a crash related to Holdout. Prevented a crash when starting up a holdout game without any holdout data. Locked COP masks are now hidden in the inventory. Fixed an issue where players that got completely downed while shooting with automatic weapons would shoot continuously. Fixed an issue where players could get stuck in a weapon holding state when transitioning between standard to mask off mode. Players can now look at previously completed storyline missions. Seperated the last mission screen for the storyline instead of replacing the final mission. Fixed an issue with suits while wearing armor. TeamAI that are downed in the secret area will now revive after reaching a certain point. Tweaked the strings for the Signature Submachine Guns. Fixed some storyline mission description typos.